Salad rocket is a type of salad which gets its name from the Italian word is derived from that means rocket. It is sometimes referred to as rocket salad. 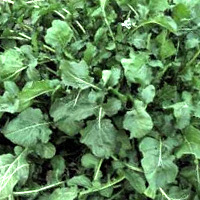 However, in the US it is most commonly known as Arugula. It also serves a a good garnish for steak. The calories in Salad Rocket per 50g(1pack) is 10 calories. Salad Rocket is calculated to be 19Cal per 100 grams making 80Cal equivalent to 421.05g with 1.55g of mostly carbohydrates、0.95g of protein、0.2g of fat in 50g while being rich in vitamins and minerals such as Vitamin K and Folate.